Integral University Center for Advanced Training, IUCAT is an Accredited Test Center of ICDL, Asia. ECDL Foundation is an international organization dedicated to raising digital competence standards in the workforce, education and society. Our certification programs, delivered through an active network in more than 100 countries, enable individuals and organizations to assess, build and certify their competence in the use of computers and digital tools to the globally-recognized ECDL standard, known as ICDL worldwide. As a nonprofit social enterprise ECDL Foundation (ICDL Foundation) benefits from the unique support of experts from national computer societies and partners worldwide to develop vendor-independent standards which define the skills and knowledge required to use digital technology effectively. We work with education and training partners, local and regional authorities, national governments, international development organizations as well as public and private sector employers in all sectors, in the delivery of our programs. The quality and reputation of ICDL is built on almost twenty years of experience in delivering our certification programs to over 14 million people and in more than 40 languages worldwide, with more than 2.5 million ICDL tests taken annually. Our success is maintained by our ongoing innovation in certification programs development, our commitment to rigorous test design methodologies, and consistent adherence to our quality assurance standards. ECDL Foundation supports the initiatives of National Operators of the programs in Europe and the Arab States from our headquarters in Dublin, Ireland and our European office in Brussels, Belgium. We have also established three regional operations – ICDL Africa (based in Rwanda), ICDL Asia (based in Singapore) and ICDL Americas (based in Panama). All ECDL Foundation operations work closely with regional, national and local partners to develop the global network of ICDL Accredited Test Centers. ECDL (European Computer Driving License) is the European Standard in end-user computer skills. It is a certification in the practical use of computers and computer applications. ECDL is referred to as ICDL (International Computer Driving License) outside of Europe. European Computer Driving License, ECDL, International Computer Driving License, ICDL, and related logos are all registered Trademarks of ECDL Foundation. 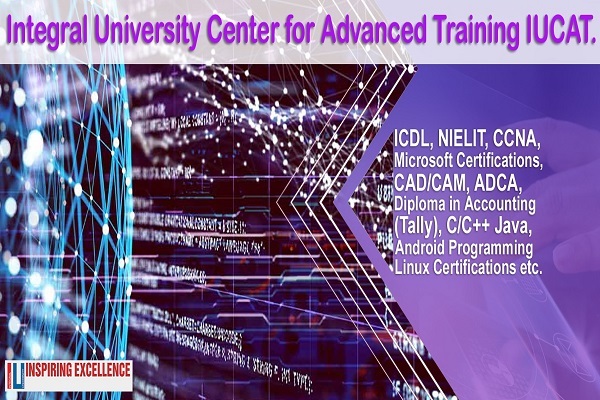 IUCAT is offering the following courses under the certification of ICDL.